Conceptual models guide the exploration of risk and protective factors. Conceptual models help us to organise our thoughts and identify relationships between the different risk and protective factors for intimate partner violence, and other forms of violence. Some conceptual models (such as the ecological model) have helped to expand our understanding of the wider societal and community factors that impact on violence experience. Consistent findings at the international level have allowed the identification of a common set of factors that are strongly associated with violence experience, but these are not the only factors that influence the likelihood of violence occurring. Most of the research identifying risk and protective factors for intimate partner violence collect information at only one point in time. The result is that it is difficult to establish whether factors that are related to violence experience caused the violence or are a result of experiencing the violence (or both). While, the use of controlling behaviours is strongly associated with violence experience, behaviours can mean different things to different people. It is important to understand the context of an abuser’s behaviour in order to fully understanding the meaning. There is no “one true cause” of intimate partner violence. Violence is typically the outcome of the interaction of many different factors. Individual, relationship, community, social and cultural factors work together to enhance or reduce the likelihood of violence being perpetrated or experienced. Violence is a behaviour which is governed by choice. Decisions and subsequent actions are influenced by societal attitudes about what is considered acceptable behaviour. 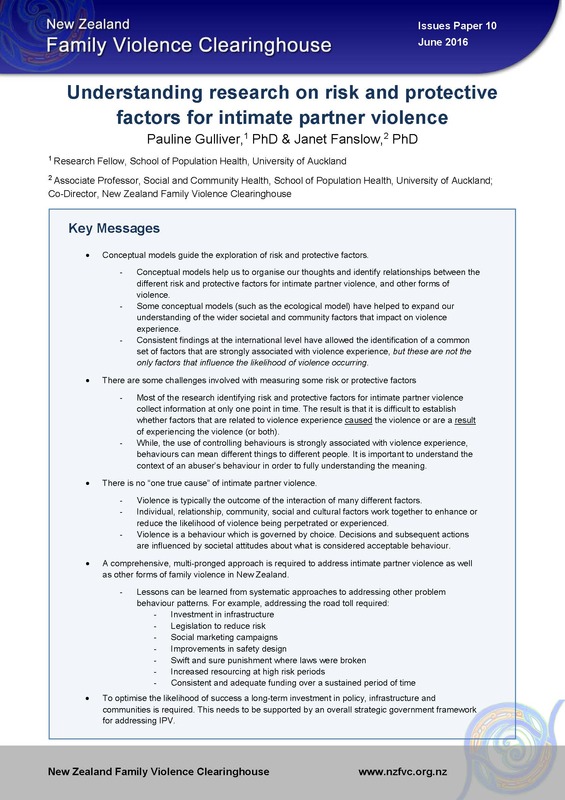 A comprehensive, multi-pronged approach is required to address intimate partner violence as well as other forms of family violence in New Zealand. To optimise the likelihood of success a long-term investment in policy, infrastructure and communities is required. This needs to be supported by an overall strategic government framework for addressing IPV. Gulliver, P., & Fanslow, J. (2016). Understanding research on risk and protective factors for intimate partner violence. Auckland, New Zealand: New Zealand Family Violence Clearinghouse, University of Auckland.